This work relates selected events in the history of the National Academy of Sciences focusing on the terms of the various presidents, from the first, Alexander D. Bache—the great-grandson of Benjamin Franklin—to Ralph J. Cicerone. In its early days, the Academy was fostered by the Smithsonian Institution to support the cultivation of science in the United States. In its current state, the Academy can be regarded as an almost independent organization representative of the basic and applied sciences, including engineering, and medicine. Special attention is given to roles played by the Academy and Academy members in three great wars, as well as side developments made possible through wartime ventures and advances in technology. The Academy's charter was introduced to Congress by the well-established Senator Henry Wilson from Massachusetts. It was passed by Congress and signed by President Lincoln in March of 1863, near the end of the second year following the start of the Civil War in April of 1861. The charter requested the members to serve the government on scientific and related technical problems without personal remuneration apart from out-of-pocket expenses such as cost of travel, housing accommodations and the like. It had no truly official home at the time, and in that sense was essentially a paper organization. 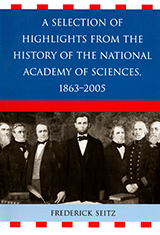 A Selection of Highlights from the History of the National Academy of Sciences, 1863-2005 by Frederick Seitz, published by Rowman and Littlefield, appears by permission of the publisher. This material is protected by copyright. All rights reserved. Please contact the publisher for permission to copy, distribute or reprint. This book is also available for purchase online from Rowman and Littlefield. Online publication of this material was made possible through the generous support of the Richard Lounsbery Foundation.